Fully open the slide door window. Using a screwdriver, disengage the clip and remove the garnish. 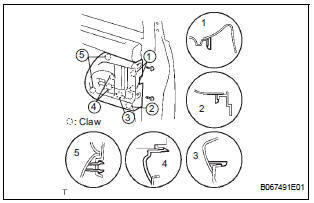 Using a screwdriver, disengage the 2 claws and remove the weatherstrip inner from the garnish. Using a screwdriver, disengage the 8 claws and remove the cover together with the window control switch. Remove the 2 screws and window control switch. Using a screwdriver, disengage the 9 clips and remove the trim board. 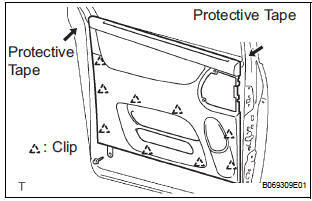 In order to prevent the door panel from being damaged, cover the areas with protective tape as indicated by arrow marks in the illustration. Using a clip remover, remove the 6 clips and weatherstrip No. 2. Using a screwdriver, disengage the 11 claws and remove the weatherstrip inner from trim board. w/ Sunshade: Remove the sunshade. Remove the 7 screws and sunshade bezel. 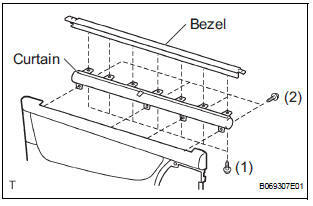 Remove the 4 screws and curtain. 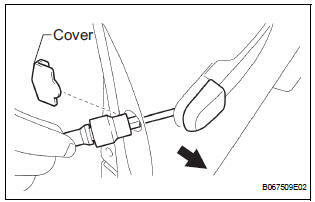 w/ Sunshade: Remove the sun shade hook. Remove the bolt and window frame. 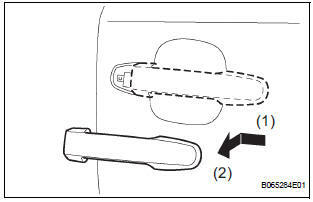 Push the window frame rear lower in the direction indicated by the arrow mark in the illustration. Remove the 2 hole plugs. Move the window until the bolts appear in the service holes. Do not damage the window. When the bolts are removed, the window may fall and become deformed. Remove the 2 bolts and window. Remove the 2 screws, bolt and inside handle. Disconnect the connectors from the lock actuator, the power window regulator motor and lock release motor and power slide door lock. Remove the 8 bolts and attachment control. Remove the nut and window frame rear lower. 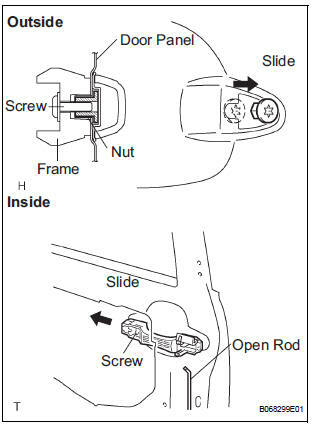 NOTICE: When the nut is removed, the window frame may fall and become deformed. 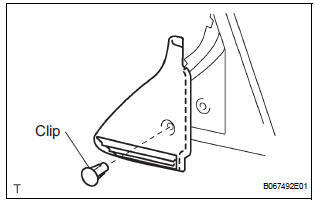 HINT: Remove the window frame rear lower through the service hole. Remove the 3 bolts and lock remote control. Remove the 2 screws and lock actuator. Remove the 2 screws and lock release motor. Remove the 3 screws and power window regulator motor. Remove the half stop control lever and door lock control bellcrank. 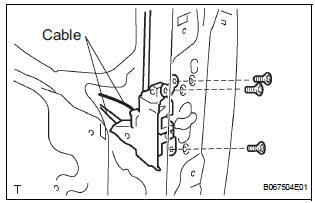 Remove the 4 bolts and the window regulator. Remove the outside handle hole cover. Pushing and pulling the outside handle in the direction indicated by the arrow mark in the illustration, remove the outside handle. Remove the outside handle pads front and rear. Remove the open rod to the outside handle frame. Using a torx socket wrench (T30), loosen the screw. 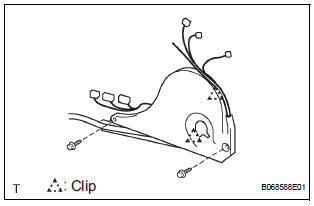 Slide the outside handle frame in the direction indicated by the arrow mark in the illustration and remove it. HINT: Remove the outside handle frame through the service hole. Remove the 3 bolts from the upper part of the control motor and clutch. 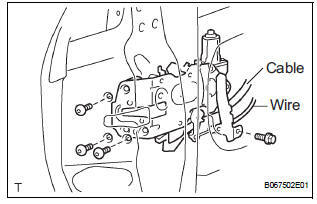 Remove the 2 clips and 4 bolts from the lower part of the control motor and clutch. Remove the control motor and clutch. HINT: Remove the motor and clutch through the service hole. Remove the 2 screws, clip and stiffener cushion. HINT: Remove the stiffener cushion through the service hole. Remove the 2 grommets and 2 clips. Using a torx socket wrench (T30), remove the 3 screws and lock. HINT: Remove the lock front through the service hole. Disconnect the cable and wire. Using a torx socket wrench (T30), remove the 3 screws. Remove the bolt and lock. HINT: Remove the lock through the service hole. Using a screwdriver, remove the 2 clips and wire. Remove the 2 screws and power slide door ECU with the warning buzzer. Disengage the claw and remove the warning buzzer. Remove the 5 screws and touch sensor.